Japan is building yet another life-sized giant robot, only this time it could very well go berserk and devour us all. Oh dear. Japan is building yet another full-scale giant robot, but instead of being a Gundam or Tetsujin 28-go, it's EVA-01 from Neon Genesis Evangelion. 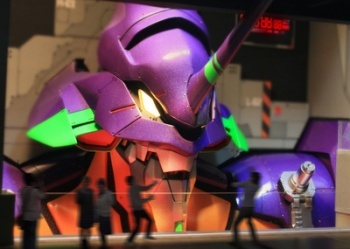 The statue - from the massive bust up - will be the centerpiece of a new attraction at Japan's Fuji-Q HighLand amusement park called "Evangelion: World - Life-Size EVA-01 Construction Project," and it will be open to the public on July 23rd. If you've ever seen the massively popular Evangelion, the aim is to recreate the famous scene where protagonist Shinji Ikari encounters the biomechanical creation for the first time. In other news, we're now all totally screwed. If you've been reading the news posts I write here for any decent length of time, you've probably noticed that there are a few things that I love - and one of those things is giant fighting mecha. For instance, my opinions on the life-sized RX-78-2 Gundam statue pretty much boil down to "Hell yes!" But this? This is different, because this is an Evangelion - and I don't care what they say about it just being from the "bust up." It's EVA-01; it doesn't need anything more than the bust to go berserk and eat us all. Hell, it doesn't even need a life-sized statue of a wimpy, emo teenage pilot to do that, either! It's a goddamn Eva unit, and it will kill us all before long. Just you wait. According to ANN, the pavilion will also have a recreation of the EVA cockpit in which visitors can take pictures, a life-sized figure of the character Kaworu Nagisu to have creepy sexual tension with everybody who passes by, a museum and a gift shop. Of course there's a gift shop. Presumably, the attraction will also feature actors dressed as visitors' fathers to coldly shun them and deny them the affection and approval they desperately seek. On the plus side, while EVA-01 might go berserk and destroy the world by turning us all into Tang as we reform a singular, base human consciousness, at least the statue makes a good opportunity for some Evangelion jokes. Seriously guys, I got a million of 'em.